Ten sweet potato plants were harvested. The yield was 1.6 pounds per plant or total of 16 pounds. This is below expectations, which is about six pounds. The poor yield is probably due to a cool wet growing season. Each center or slip was marked with a long stake to facilitate digging. Prior to digging all the vegetation was removed. The vegetation is most prolific. The potatoes were placed in the Sun to dry thoroughly before storing in the root cellar. 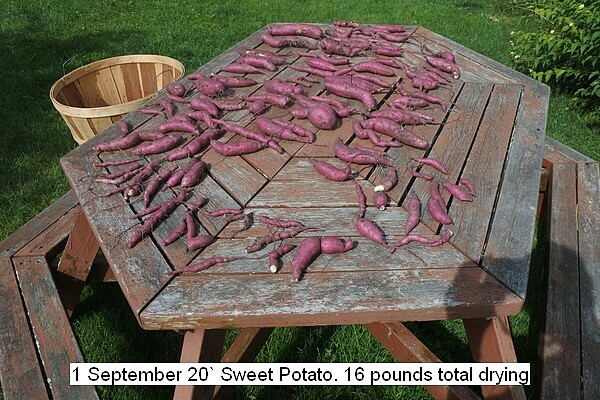 This entry was posted in Uncategorized and tagged 1 September 20 Sweet Potato Harvest, Sweet Potato Harvest. Bookmark the permalink.